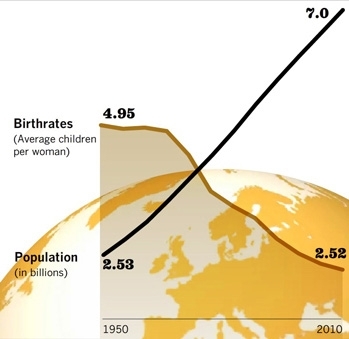 The reality of falling fertility rates while global ‘population explosion’ goes on is depicted in the Figure above. The relentless growth in population might seem paradoxical given that the world’s average birth-rate has been slowly falling for decades. Humanity’s numbers continue to climb because of what scientists call population momentum. As a result of unchecked fertility in decades past, coupled with reduced child mortality, many people are now in their prime reproductive years, making even modest rates of fertility yield huge population increases. This according to John Bongaarts of Population Council in New York translates to adding more than 70 million people to the planet every year, which has been happening since the 1970s. The African continent is expected to double in population by the middle of this century, adding 1 billion people despite the ravages of AIDS and malnutrition. Kenya’s Total Fertility Rate (TFR) estimated at 8.1 in 1977/78 declined to 4.6 children per woman by 2008/9 (KDHS 2008/9). This drop was largely attributed to increased practice of modern contraceptive methods over the time, and improved educational status of women. The contraceptive prevalence rate (all methods) rose sharply since the early 1980s; rising from 17% in 1984 to 33% in 1993 and to 39% of married women in 1998 and 46 percent in 2008/9. Kenya’s population growth rate increased steadily from 2.5 percent in 1948, peaking at 3.8 percent in 1979, this being one of the highest growth rates ever recorded. Demographic transition began to manifest in 1989, when population growth rate declined to 3.4 percent and further to 2.5 percent in 1999, but estimated at a higher level of 2.9 per cent in 2009. Owing to the past growth rates Kenya’s population is still youthful with nearly half being aged 18 years or below. This is a clear demonstration of demographic momentum- a phenomenon of continued population increase despite reducing fertility rates, which is brought about by waves of large populations of young persons entering reproductive age in successive years. This may in part explain the addition of one million people annually to Kenya’s population referred to above, contributing to the “youth bulge”. I have in a previous post asked “Can Kenya make the “youth bulge” a source of strength not a threat?” Indeed, this can happen, with better planning and viable economic policies that mobilise the potential of every corner of this nation. Current investments on family planning (including the proposed Joint Global Birth Control Push), are not expected to translate into slowing of population growth rate in the short or medium terms, but should be viewed as a long-term goal. On the other hand such investments will empower women and men or couples as the case may be, with the choice when to have children and how many to have. This will lead to healthier families, and more productivity. Strengthening of institutions and equitable investment of resources can unleash a strong and better-educated workforce with fewer children to support and no elderly parents totally dependent on them. In such a scenario, the “youth bulge”,generated by our recent demographic history and fertility decline through effective fertility regulation measures, could transform to the driving force behind economic prosperity in future decades. UPDATE 06-10-2012: Recently Kenya’s Minister of State for Planning, National Development and Vision 2030 confirmed Government’s commitment to FP and the belief that no woman should die while giving birth to life. On October 2, 2012 Kenya’s Parliament approved the Sessional Paper No. 3 of 2012 on Population Policy for National Development which has (among others) the objective of lowering the TFR to 2.6. When on 31 October 2011 the earth’s population clocked seven billion people, this happened to be only 12 years after we had celebrated the sixth billion. So I started to wonder where I was in the complex arithmetic, realising that while it had taken 123 years to change numbers from the first to the second billion, the increase from the fifth to the seven billion people had taken just 24 years. I started thinking how many billions I had in fact ‘seen’, and who in my foggy past might have existed before the clocking of the first billion. This short history is summarised in the accompanying table, which shows that whereas my predecessors counted in the first and second billion, in my short life I have been counted within six consecutive billions- from the second up to the seventh billion; and God willing, I might also spill to the eighth billion. In my lifetime, I have witnessed the earth’s population almost triple. Around the beginning of the first millennium the world’s population was about 300 million, and it would take more than 1,600 years for the world population to double to 600 million. The rapid growth of the world population is a recent phenomenon, which started around 1950, as a result of significant reductions in mortality thanks to emerging medical technologies. By the years 2000 the world population had reached an estimated 6.1 billion, which was nearly two-and-a-half times, the population in 1950. The highest global population growth rate (2.0 per cent) was recorded in the period1965-1970, in Kenya, reaching the high of 3.8% in 1979. I have in a previous post asked Can we make the “youth bulge” a source of strength not a threat? Indeed, this can happen, with better planning and viable economic policies that mobilise the potential of every corner of this nation. Strengthening of institutions and equitable investment of resources can unleash a strong and better-educated workforce with fewer children to support and no elderly parents totally dependent on them. In such a scenario, the “youth bulge”, generated by our recent demographic history and fertility decline through effective fertility regulation measures, could transform to the driving force behind economic prosperity in future decades.